In 2011, I was looking for something improbable: a place in Brooklyn, NY where I could live life in the city, and grow my own food. After almost a year of searching, and a few mishaps, I set my sights on a place with a little back yard, mostly concrete, but with a few in-ground beds, south-facing light from midmorning til evening, and no neighboring buildings or trees so large that they would make vegetable gardening difficult. It needed work… but the basics were there. I could see some evidence of vegetable gardening happening there, along with a large helping of scraggly rosebushes, shrubs, hostas, and a whole lot of weeds. I had been container gardening for a couple of years on and off, sometimes in pretty huge containers, but was never really satisfaied with the results for the amount of work it took. I set my sights on improving this little patch of the city. I moved in in December, a few months after first seeing the place as I first saw it in this photo, taken in July. For the first half of 2012, I was renovating the place. I wanted to plant, but the interior was the priority. I planted a few rather large tomato starts towards the beginning of summer when I was finally able to take a break from renovation. I think I got a small harvest that year, but I had started late and had an overgrown garden of shrubs and weeds to deal with as well. 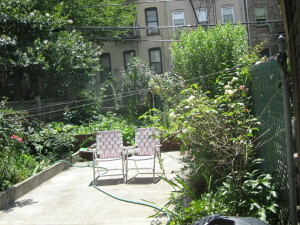 The next season, I started getting serious about the garden, but there was also more renovation to do. So 2013 might have been the first year where I really started putting some work into the place. Improving the soil, pulling out unwanted shrubs, and generally tidying up the place. I learned a few things and the harvest was more diverse. Towards the end of the year I made sure that the next season would get off to its start unhindered. In 2014 and 2015 I’ve been improving the soil constantly, enhancing our seed propagation setup, taking notes in a journal, setting goals and making them happen, building a small community of collaborators and enthusiastic friends, and tracking our harvests to the bean. I have a garden partner now who is into it as I am, which is an amazing blessing to me—and makes it fun as hell, too. We eat almost everything we grow, and the rest we give away. Through research and direct experience, I’ve learned an incredible amount in the past few years. Now, all I have to do is remember to do is to take a break once in a while, and enjoy the transformation.